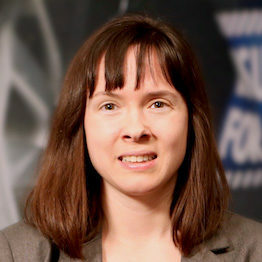 Jessica Cicchino is vice president for research with the Insurance Institute for Highway Safety, an independent, non-profit research and communications organization located in Arlington, Virginia dedicated to reducing deaths, injuries, and property damage on our North American roads. She conducts and oversees research on a variety of highway safety issues, including collision avoidance technology, automated traffic enforcement, drug- and alcohol-impaired driving, and the safety of pedestrians, bicyclists, older drivers, and motorcyclists. Prior to joining the Institute as a research scientist in 2012, Dr. Cicchino was a research psychologist with the National Highway Traffic Safety Administration. She holds a B.A. from Vassar College and a Ph.D. in psychology from Carnegie Mellon University.